Genentech has grown to be quite a large and influential company over it’s 30+ years. One thing that has remained the same is a small group of employees and wine fanatics known as gOenophiles. Much like many things at my company, the penchant for adding a “g” to the beginning of any otherwise normal word is conserved with the naming of this loose-knit group of blind wine tasters. With many disparate backgrounds, temperates and interests gOenophiles do have two things in common, a love for wine and deep conviction in the power of tasting wines blindly. Tasting wines blindly has a tremendous affect on your palate. The best way to try and quickly build your palate and perhaps more importantly, a *confidence* in your own palate is to put together a blind wine tasting. Tasting wine’s with little to no prior information forces you to really probe the colors, aromas and flavors that you encounter. Is the red wine in front of you bright ruby, a darker garnet or even showing some browner shades on the edges near the rim? Is there a lot of fruit in the nose or is it earthy or smelling like the rich dampness and organic mustiness of a forest floor? What kind of fruit is is, which is dominating the flavors in your mouth? Are they like red fruits such as cherry and raspberry or more darker fruit like blackberry? Or maybe that white wine has a whole lot of white fruit like peach, pear and nectarine? The unwrapping of the bottles at the end of the tasting adds a very nice sense of anticipation or even trepidation, in the event that you tried to guess the regions or the grape varieties that made up the wines that you evaluated. The power of the blind tasting the lack of bias in your judgments about the wines. There’s no high sticker price to make you think you should enjoy the wine more than the one sitting next to it that might be as little as a tenth of the other’s price. You also tend to find, particularly early on like I did, that certain wines, grapes or regions are not as enjoyable to your palate as you previously thought they were (for me I found out that I was much pickier about Cabernet Francs that I thought I liked, no matter who made the wine). I’ve attended three gOenophiles’ wine tastings now, all with great enjoyment. The cast of characters is widely varied, but all have one thing in common…no hesitation about voicing their opinions on the wines! Don’t get me wrong, they are not “snobby”in the least, rather they are passionate people and love to debate (or even bicker) about the wines they liked or didn’t like in the current tasting. They might give you a hard time here and there, but they expect you to stand up for yourself and to do the same. And I know first hand, that they are very forgiving to wine newbies! Last Friday’s tasting (02/29/08) was a set of 9 high-scoring (Wine Spectator) Bordeaux wines, all 9 coming from the great cellar that John and Lynn have put together over the years. The wines were mainly from the 1995 vintage, with two coming from the 1996 vintage. Both vintages were highly rated, with 1995 being considered the finer vintage. I for one, was absolutely ecstatic when I first received the email invitation for this tasting…when am I going to get another chance to taste some nicely aged, high-rated Bordeaux…blind, no less?? We also had one further wine that was poured unblinded at the end, as a nice finish to the evening. 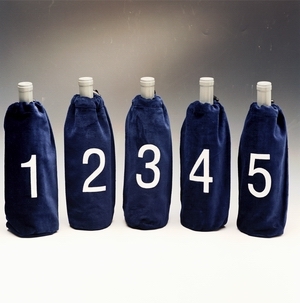 The ways of performing a blind tasting are numerous, but the key ingredient is that all of the participants are blinded to the individual bottles of wine that they are about to taste (sometimes the host needs to know their provenance, however). We do our tastings double-blinded, so that no one knows what they are tasting, including the current host. We do know the general theme of the tasting however, to help us along. The three tastings in which I’ve participated were California Cabernet Franc, 1990’s Gabrielli and Lytton Springs Zinfandel (Sam Gabrielli himself, was there and tasted and critiqued his own handiwork alongside us…ended up being one of the most critical, too!) and the latest, the ’95-’96 Bordeaux. Everyone trundles down to the tasting room and pulls their glassware out from each of their highly-stained wine case boxes. Being mainly scientists, we use tiny pre-marked graduated beakers to pour an exact amount into each glass. Kevin (our (g)clan’s fearless leader) or the host provides a preprinted sheet for notes and we begin, munching on mild bread and cheeses as we drink. At the end of the fest, following random chatter, outbursts, accusations of infidelity and large amounts of innovative slander and profanity, we score the wines on a scale from 0-3, stepping by .25 points. The loose explanation of this system that I was given by Lisa and her husband Joe is that 0 is a wine that you would only use to clean your least-favorite toilet, 1 is a wine that you probably would drink if it was free and you didn’t want to insult the person who gave it to you. A 2 is a pretty good wine, you’d probably go out and buy it at a later date and 3 is a wine that you will flat-out kill for and giving that score is sure sign that everyone else in the room better be on their toes and well-armed. Complicating the tasting last Friday was my ability to be an idiot while in the presence of others. I was making a lot of people somewhat nervous, particularly Bonnee sitting next to me. I had a few 3’s in my early scores, of wines that I thought were pretty good…forgetting that the scoring system only went to 3 and not 4! Once people finally showered me with good-natured insults I realized my mistake and humbly apologized to the rest of the group, not realizing that I was implying I might have to rampage across the room to get the remaining wines I’d accidentally scored as worth a killing! The scores now properly re-tallied, we took the final group scores and unblinded the wines. My favorite wines were #5 and #7, the ChÃ¢teau d’Armailhac and the ChÃ¢teau Pontet-Canet. The group’s top two were the Pontet-Canet, followed by the ChÃ¢teau Dauzac. None of the group scores drifted close to the hallowed 3, but my two favs tied at 2.75. I liked the wines as a whole, actually. I found them to be medium to medium-full bodied, but with a big tannic structure that still didn’t seem integrated, even if a lot had lost a fair amount of their fruit at this middle-aged time in their lives. A lot of red and blue fruit could be found, however, with some showing a lot of nice black fruit and that mushroom or forest-floor characteristics from their fine (if big) tannins. Good stuff and big thanks to John and Kevin for sharing their wines. Please check out my notes for the 9+1 wines that we tasted on Friday, with their scores adjusted to the WineLog 5 star scale. I’ve tagged all of the current lineup with “gOeno95-96B“, the Gabrielli tastings’ with “gOenoGabLytt” and the Cali Cab Francs with “gOenoCaCF“. All of the gOenophiles’ wines previously tasted and in the future are also and will be tagged with “gOenophiles” if you would like to list them all in your own WineLogs. Enjoy!